South Yorkshire firefighters attended hundreds of medical emergencies last year, under the county’s first Emergency First Responder (EFR) scheme. The scheme is a joint initiative between South Yorkshire Fire and Rescue (SYFR) and Yorkshire Ambulance Service NHS Trust (YAS), which sees firefighters called out to certain life-threatening incidents at the same time as an ambulance. On-call firefighters from Rossington, Stocksbridge and Dearne fire stations were sent to 358 medical emergencies in 2016, including cardiac arrests and incidents stating chest pains and breathing difficulties. At other incidents, firefighters have provided support and made the patient comfortable until the ambulance service arrived on scene. Training for firefighters who are part of the scheme includes basic life support, cardiopulmonary resuscitation (CPR) and oxygen therapy. They are equipped with a kit, which includes oxygen and an automated external defibrillator to help patients in a medical emergency such as a heart attack, collapse or breathing difficulties. An EFR is dispatched at the same time as an ambulance and does not replace the usual emergency medical response from YAS. 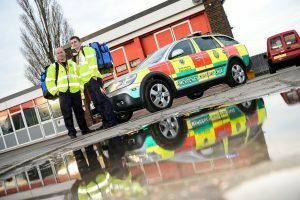 However, their location within the local community could mean they are nearer to the scene in those first critical minutes of a medical emergency, delivering life-saving care until an ambulance arrives. They also support and complement other volunteer community first responder schemes within South Yorkshire, ensuring the level of medical provision to local communities is supplemented. Emergency First Responders are only available for dispatch when staffing levels at their fire station allow and the scheme does not impact fire cover.